Before we begin, it is very important to note that everyone’s skin is unique and will react differently to the exact same products or ingredients. There is no such thing as a “one size fits all” product and these regimens are recommendations, not guarantees. Taking care of your skin is a process and results require consistency and patience, and in a lot of cases, simplicity. Even though there are a lot of products in this range, you do not need them all. I would suggest starting with around 5-7 depending on your skin type and recording your routines to track the effects before adding more. Even though each skin type will require a different set of products to maintain a healthy dermis, there are some ingredients that I believe everyone could benefit from. Of course, sunscreen should be a priority as sun damage can cause a variety of issues both long term and short, as well as antioxidants, retinoids/retinols and moisturizing factors that support barrier function. These ingredients form the basis of a good “all-round” routine that should keep the skin healthy and able to protect and repair itself effectively. I know many of you have only discovered Deciem since The Ordinary launch, so I want to point out that their other skincare line, NIOD, has brilliant products. Some of them will be mentioned here and I highly recommend you check them out. The Ordinary doesn’t have it all (yet), so if you’re looking for a complete Deciem routine, NIOD will definitely help fill in the gaps. Morning: – Cleanse, NIOD SDSM and CAIS (if you use them), toner, water-based serums, emulsions, creams/balms/oil, sunscreen/primer. Evening: – Double cleanse, NIOD SDSM and CAIS (if you use them), exfoliating toner or retinol, water-based serums, emulsions, creams/oils/balms. Of course, this is not set in stone and depends on the texture of the products you are using (see The Ordinary – How To Create A Skincare Routine for more information on this) and some products are to be used twice daily, others just a few times a week and some just once a week, so please read all instructions carefully and again, keep an eye on how your skin is reacting. The goal of this routine is to calm inflammation, support a healthy functioning skin barrier, balance oil production, heal blemishes (including red marks/scarring) and prevent new ones from forming. Hydration is extremely important for compromised (acne prone) skin and improving barrier function will help it to heal and protect itself from infections and bacteria that lead to inflammation and blemishes. Extras: Salicylic Acid 2% Solution to spot treat, NIOD FM as an anti-inflammatory masque and Magnesium Ascorbyl Phosphate 10% if it does not cause irritation as an alternative antioxidant product to EUK 134 0.1%. Obviously with this skin type the goal is keeping the skin hydrated and moisturized. Each step does exactly that and should help the skin stay plump, smooth and soft. Extras: Buffet if wrinkles are a dry skin side effect and AHA 30% + BHA 2% Peeling Solution as a weekly treatment. With oily or combination skin the most important thing is balance. These products will help the skin regulate its oil production by providing it with the moisture and hydration it needs. The acids will help stop pores getting clogged by the excess oil and sebum. Extras: Salicylic Acid 2% Solution or AHA 30% + BHA 2% Peeling Solution as a weekly treatment. Improving dull skin takes time and patience, but this routine should help the skin shed it’s hyperpigmented cells revealing a bright, clear, uniform skin tone. Granactive Retinoid 5% in Squalane or Retinol 1% in Squalane (on alternate night to the Vit C 30% and R 3%+FA 3%). Extras: AHA 30% + BHA 2% Peeling Solution or Lactic Acid 10% + HA as a weekly treatment. With sensitive skin the important thing is to support a healthy barrier function that will protect it from adverse reactions and keep it calm and balanced. Extras: EUK 134 0.1% or Ascorbyl Glucoside Solution 12% for some antioxidant protection if your skin can handle it. Mature skin needs lots of hydration and targeted treatments to keep skin smooth, soft and youthful, which is exactly what these products should help you achieve. Extras: AHA 30% + BHA 2% Peeling Solution or Alpha Lipoic Acid 5% as weekly treatments and Argireline Solution 10% for deep wrinkles. If you have normal skin you’ll find that your skin functions very well most of the time, rarely breaks out, heals itself quickly and is generally balanced and hydrated. Because of this you don’t need an overly complicated routine, just some basics to support the equilibrium with some extras to tackle any issues you may have like sun damage, on set of fine lines or wrinkles or hormonal congestion. Extras: AHA 30% + BHA 2% Peeling Solution and/or any of the targets treatments mentioned above that suit your needs. As I said earlier, skincare is not an exact science and your skin may react exactly as it should or not at all. These recommendations are a guide to help you choose the right products for you, but once you have them, it’s important you track how your skin responds and adjust accordingly. You might find you like using an ingredient more or less or some products might work really well and others not at all. 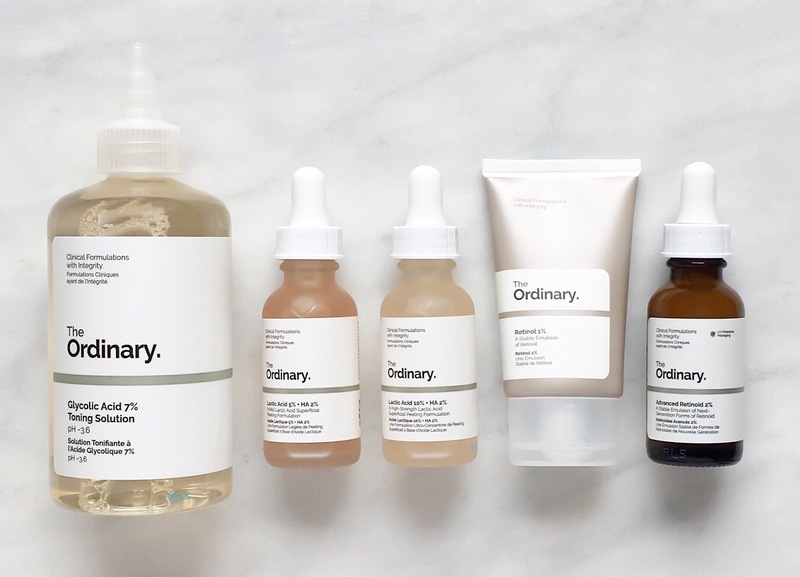 The beauty of The Ordinary is that you can mix and match the products to create a routine that is perfectly tailored to you with ingredients that will address your specific issues. Don’t be afraid to experiment (with caution) and really try to discover what your skin responds to so you can be a more informed consumer. Hi. I’ve discovered your blog today and already had a good rummage.very informative. I would appriciate your take on the matter of combining peptides and L-ascorbic acid. according to the Ordinary guideline it is best to not use peptides in the same routine as direct acids and L-ascorbic acid. but for the past 3 months ,as part of my AM routine, I have been using a L-ascorbic+ferulic acid serum and layering on top the Matrixyl 10% + HA with no problems. after reading about the restriction,I’m wondering if it’s because they cancel each other and not necessarily to do with irritation? would it better to wait 30 minutes between the vit C and Matrixyl? I am also thinking about switching the Matrixyl to the PM but I’m using an AHA serum and so the same problem of not using peptides in the same routine as direct acids still stands. please HELP :-).